Forest is an app that helps you stay focused in a pleasant way. The web has made us all a bit more hyperactive, a bit more easily distracted. There’s simply too much to do at any given moment. It’s hard to stay focused. There are numerous apps and products out there that purport to help hone your focus while you’re on the web, but Forest is by far the most pleasant and positive of them all. 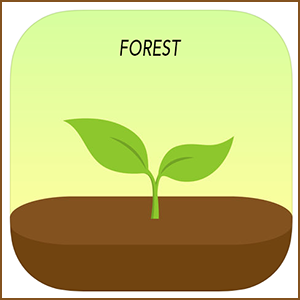 Forest, which is available on iOS, Android, and as a Chrome Extension, lets you “plant trees” while you accomplish whatever task you have set out to do. The tree begins growing as soon as you click to plant it, and it dies as soon as you click out of the app. 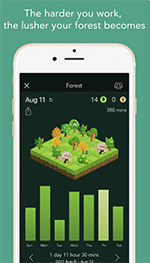 Forest includes a timer that counts down each time a tree is being planted, showing the amount of time it will take until the tree is fully grown. Once it is fully grown, you can add it to your forest, as visual proof that you spent a substantial amount of time focused on the task at hand without being distracted by the allure of the web’s infinite possibilities. The app is also collaborative, allowing you to plant trees with friends while working on a shared task. The app also gives you detailed statistics about how much you use your phone, almost like a Health app for phone usage. If you’re anything like the rest of the world, the app should convince you to put the phone down more often and start growing some more trees. At $1.99, it’s a somewhat steep price to pay for Forest. However, the Chrome extension is free. And either way, both are worth it.